FitnessMAD™ - Double Grip Medicine Bal - 7 Kg - Donkergroen - Body Works fitnessgroothandel met 1800 Sportmateriaal, Fitnessproducten en gezondheidsproducten uit voorraad. Offering all the benefits of the standard Medicine Ball, the Double Grip increases control and ability to cope with heavier weight. Despite the handles the Double Grip remains a perfect sphere. Can be inflated or deflated to suit required hardness. 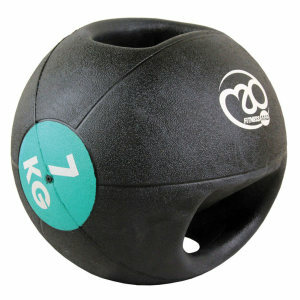 One piece moulded rubber ball with 2 handles, easy to grip with one or two hands; these balls bounce are waterproof for in or outdoor use. Available here in a 7kg weight.